I call the books I design and make "artist's books". According to Wikipedia, "Artists' books (also called bookworks) are works of art realized in the form of a book. They are usually published in small editions, though sometimes they are one-of-a-kind objects. 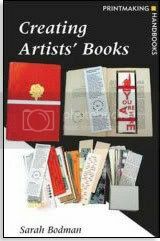 Artists' books have employed a wide range of forms, including scrolls, fold-outs or loose items contained in a box." Bodman works at the Center for Fine Print Research at UWE Bristol, where she is big promoter of artists' books. The Center has an informative bi-monthly newsletter that is available online and produces a bi-annual yearbook of the book arts. One of their projects I particularly like is Bookmarks: Infiltrating the Library System, which distributes bookmarks made by artists to encourage interest in the book arts. Thanks for sharing this with us, Susan!